I originally wrestled between this and “empathy”. It was pointed out that empathy is morally neutral and can be used for good or evil. On the one hand, empathy can lead to compassion and altruism; on the other hand, psychopaths and sexual predators groom their victims by exploiting their well-developed empathic skills. Compassion better represents the point I am trying to make. The suggested addition of “conscience” is, I think, an excellent one. It appears to me to be uniquely human and follows from our ability to place ourselves in time. We recall the experiences and lessons from our past lives and reflect on these in developing a moral framework for our future actions. It’s a kind of “moral matrix”, or prism, if you like. Although Shakespeare’s most acclaimed character remarks “conscience doth make cowards of us all”, I do believe that a conscience, consistently but responsively applied over time, earns a person greater respect. So, “conscience” makes it four, not three. I’ve nothing new to add to my earlier remarks about “curiosity” and “competition” as such. But I do want to talk about the interrelation between these four human characteristics. 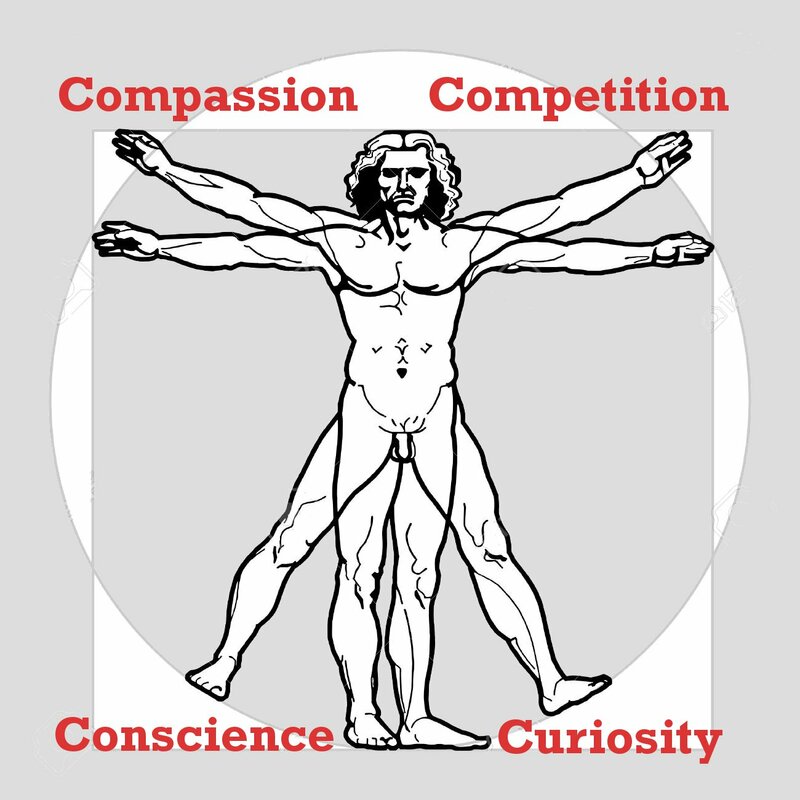 I placed conscience and curiosity at the base of my new diagram as I believe are, in some sense, “causes” and compassion and competition “effects”. Another way of putting it is that the bottom two are inward, almost mechanistic, components of the way we think and the upper two are the contrasting outward appearances of our actions. In practice, all four interact, but the left / right choice is also deliberate. 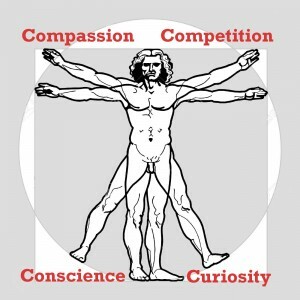 Conscience and compassion are natural bedfellows, as are curiosity and competition. An academic in, say, psychology or philosophy could say this is simplistic: it is, deliberately so. But my firm conviction is that an awful lot of fruitless argument and debate arises because the two parties haven’t agreed the basic assumptions from which they’re arguing. This is my attempt at establishing some ground rules! Of course, it’s the actions that matter, and future posts will return to the balance and conflict between compassion and competition. But curiosity and, especially, conscience might get a look in too!